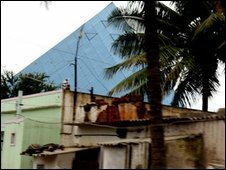 Bangalore is an Indian city where hi-tech and crippling poverty live side by side. 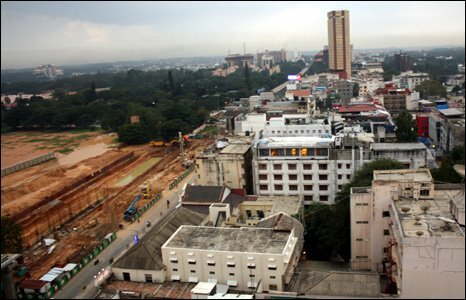 As the rate of development in Bangalore gathers pace, some fear that the many impoverished communities that also call the city home may be left behind. Since the liberalisation of the Indian economy in the 1990s, the Indian tech sector has expanded rapidly. The major players - including Microsoft, Infosys, Cisco and Google - exist in enormous "tech parks" crammed with tall, shiny office buildings. Meanwhile on the same block, piles of rotting rubbish, beggars and stray dogs surround traffic that is heavy with pollution and often locked in a loud and aggressive jam. Contrast in this city is not new; the levels of poverty are growing faster than the tech industry as migrant workers from other states join the population to aid the development. There are concerns that this impoverished population could be left behind in the city of the future, unless big businesses acknowledge that the local infrastructure is under a great deal of pressure. Many foreign businesses have set up outsourcing hubs in Bangalore and beyond - India is a leader in this type of business. Meanwhile non-governmental organisations and aid workers struggle to support the poorer aspects of society, and many believe that big businesses could have a more influential hand in helping those who are not doing so well out of the tech boom. Azim Premji is the chairman of Wipro, one of the largest companies in India. He recognised the issues of his local communities and created the Azim Premji foundation. It is a separate venture to his corporation and privately funded. It addresses methods of education in the hope that supporting youth will mean creating a better society in the long run. If corporations accept that their employees have a life beyond the work place then they should take some responsibility and reach out to that life. Foundation chief executive Dileep Ranjekar believes that large corporations could be making more effort to invest in their communities. "Many corporate efforts are fairly myopic, narrow minded and self centred. These are strong words but they are realities," he argues. "If corporations accept that their employees have a life beyond the workplace then they should take some responsibility and reach out to that life." Bangalore is not the only tech city in India. Hyderabad was initially seen as a forerunner in the race for a technology capital. Nishant Shah is the director of research at the Centre for Internet and Society. He says that the problems Bangalore faces are not unique. "People only look at the IT industry and economy in Bangalore. But there are questions of culture, language and communities which also constitute this city." However winds of political change may begin blow in the favour of smaller businesses, as India's bureaucrats are starting to emerge from more diverse backgrounds. Some live themselves in neighbourhoods that are officially designated as slum areas, and so have first-hand knowledge of the infrastructure problems that need to be addressed. I think the argument about Bangalore changing too fast and growing too fast is a false argument. "It's these political conflicts and upheavals that show what democracy is all about," said Dr Solomon Benjamin, associate professor at the National Institute for Advanced studies. "I think the argument about Bangalore changing too fast and growing too fast is a false argument." On the surface it may look as though big business, outsourcing and technology have brought about a socio-economic catastrophe. Along the Mahatma Gandhi Road, couples used to walk, people used to meet. Today it is a muddy area where the already crazed traffic struggles to get around the metro site construction. People don't tend to want to spend time there. Bangalore feels like a city in planning where too many people turned up to populate it too soon. But it's those people who will hopefully build and restructure their city to make it work for them. Dileep Ranjekar believes that they will pull together. "When the pride of a society is challenged, people unite. Change comes when there is an acceptance that it is in the self interest of every individual. Everyone sees the benefit of that. You must create the right conditions."